Tern steers into cargo bike territory with the new, compact but full featured GSD. The Tern GSD is a category disrupting design bike that takes cues from cargo bikes, electric bikes and folding bikes. Similar in length to the Benno Boost and Bike Friday Haul-a-Day, some might argue that the GSD bests both of these with respect to overall functionality. Tern uses 20" wheels front and rear to shrink the overall length of the bike to just under 72" - about a foot shorter than longtails like the Yuba Spicy Curry or Xtracycle EdgeRunner. Nevertheless, with a few exceptions, the overall capacity of the GSD relatives to it's longtail predecessors is comparable. Two small kids fit easily on the back of the GSD using Yepp child seats. One adult can fit comfortably as well. Two mid-sized kids, and two larger kids will not fit comfortably on the GSD given the overall space available for passengers and their feet. As well, no Hooptie is currently available for the GSD making safe portage of mid sized passenger(s) more complex. That said, this bike rides incredibly well, has incredible cargo options and accessories ready to go, and is built to last. We are super excited about this bike and believe that for many families in the Seattle area, this bike will be a true contender as they weigh their options. Featuring Bosch Performance Line motor. The mid-spec motor from Bosch offers great climbing power and efficiency, reliability and minimal noise. Optional Dual Battery yields crazy range. The GSD comes stock with one 400 Wh battery. You can upgrade with an additional 500 Wh battery pack to double your range, with upper limits over 100 miles per double-battery charge. Batteries lock to frame for security, and battery location on the GSD is low and central for great handling. Plenty of kid and cargo options...carries up to 6 panniers! Take it to the kids' school, take it to the office, take it to the grocery store or lumber yard, even take it camping. The GSD offers you so many options, all at a competitive price. Stand it on end if your space constrained. The GSD stands securely on the rear end - balancing on the rear tire and rear rack. By folding down the handlebar/stem and removing seat post, the overall size of the bike is that of one 6' tall human standing upright - your new useful friend ready to ride whenever you are. Crazy patented adjustable stem-thing. Tern loves gadgets and cool parts. Thankfully, they also care about safety. Their super-strong, super-adjustable quick release stem allows you to customize the fit of this bike on the fly, or easily share it with another rider of a different size. Awesome awesome 4 piston brakes. 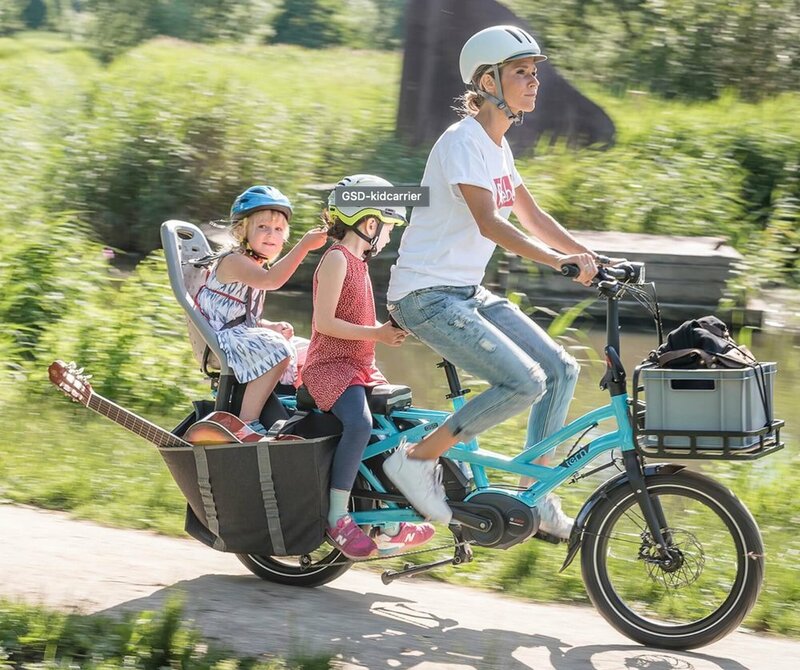 Electric family and cargo bikes, designed for massive loads, aren't always spec'd with brakes that work great on steep downhills and wet conditions. Not so with the GSD - Magura MT5 4-piston hydraulic disc brakes are some of the best made for extreme use. One more thing! Custom oversized 20" tires. Tern called in a favor with their friends at Schwalbe to get a custom tire mold made for the GSD tires. Oversized 20" tires ride great and protect the bike from stress when loaded to the overall rider + cargo max of 400lbs.